In love with Neon’s? We totally understand! These fresh and peppy colors are unquestionably the shades of the year and have taken the fashion aisle by the storm. The color palettes give the sweet 16 feel and have added a lively twist to the nine yard drape which I can say the Bollywood fashionistas are utilizing in their own dramatic way. Emerging from the west, they have been quite successful in coloring the Indian ramps and streets in vibrant shades of orange, yellow, pink, blue and green. Thanks to Manish Malhotra for making the hues have a grand official entry in the fashion world. And when it comes to the trendsetters, the first who comes in my mind is Deepika Padukone in her lime green sari. Another fashionista, who is quite popular in making style statements, is Sonam Kapoor who has been donning the trend in quite a few gatherings. Balancing the neon look is something to learn from Priyanka Chopra giving the eyes a hot and soothing feel at the same time. Kareena Kapoor, Kajol, Madhuri Dixit and I can name as many as you want, who have made this trend quite a successful and adaptable one. If we talk about innovations, then variety of fabrics have been experimented in the world of neons like cotton, chiffon and silk. Guess who was seen sporting the look in the political world! 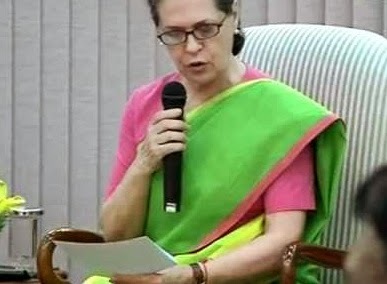 Sonia Gandhi! Giving quite a refreshed feel, she was seen in a green neon sari. Finally some colours in the dark world! The trend is expected to stay for quite a while now with the scorching heat calling for the light fabrics and brighter colours. If you are scared to try neon, you can first try teaming it up with light colours like beige to save yourself from over -the-top look. For the gutsy ones, you can just go and buy them without thinking twice. The trend is going up and is expected to reign! Have a fresh and colourful summer!